Since the end of World War II, the United States has taken on an increasingly more pervasive military presence in the world, with approximately 172,966 active duty personnel serving outside the United States and its territories as of December, 2012. This figure does not include non-military employees contracted with the U. S. Armed Forces at the hundreds of military and diplomatic facilities located around the globe in approximately 150 different countries. Although many of these active duty enlistees are involved in combat duty, others are deployed as part of peacekeeping missions, military attachés, or security units for embassies and consulates situated peacefully in countries that are on mutually good terms with the United States. On any given day, each and every one of those that are stationed overseas are a potential target for terrorists – and this is not just true for U. S. military personnel, but for the forces of any nation that could become the target of radically motivated violence that does not honor the normal conventions and standards of international cooperation. In fact, U. S. military personnel and those civilians contracted by the military around the world have many times been the victims of transnational violence – and in some cases those attacks have taken on the aura of historical infamy. Not quite one year prior to the horrific events of 911, an atrocity against the United States Navy foreshadowed the diabolical notoriety al Qaeda would claim in worldwide terrorism. On October 12, 2000 the guided-missile destroyer USS Cole lay anchored in Aden, Yemen for the routine purpose of refueling – which required the complete mooring of the ship early that morning. 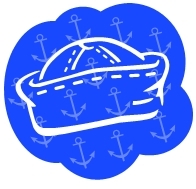 At about 11:18AM, a small craft rapidly approached the Cole from the port side, exploding against the hull of the military vessel just where the galley is located – detonating explosives that had been molded into a shaped charge on the exterior of the smaller attacking boat. Inside the galley, crew members of the Cole were lining up to receive lunch, unsuspecting of the imminent explosion – which was carried out as a suicide mission by 2 al Qaeda operatives who stood at attention and saluted Cole sailors during the final seconds of their lives. The blast killed 17 sailors and wounded another 39, who were transported by means of MEDEVAC to a French military hospital located in Djibouti, a country located in the Horn of Africa – from where they were later moved to Germany. 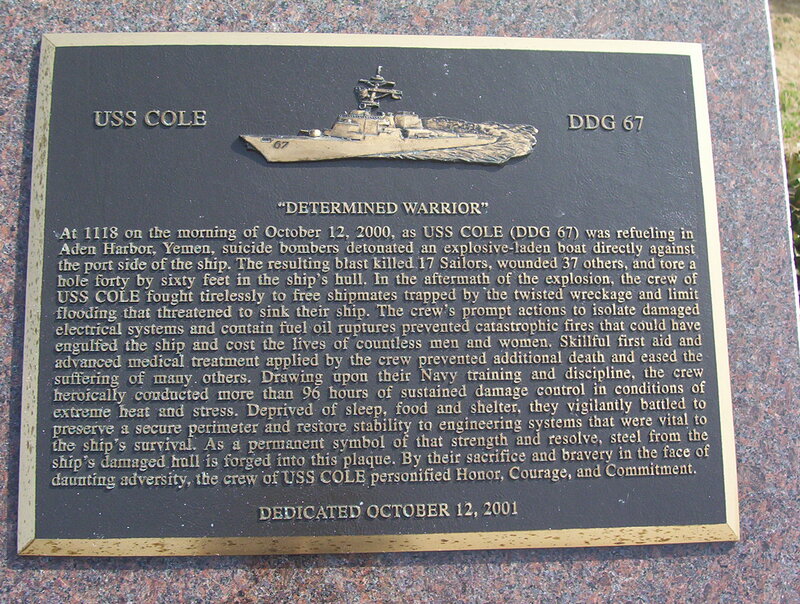 Heavily damaged with a gaping hole on the port side, the USS Cole was eventually “hauled” to Pascagoula, Mississippi by a gigantic Norwegian salvage ship named the Blue Marlin. Repaired and upgraded, the fighting ship eventually returned to full active duty in April of 2002. 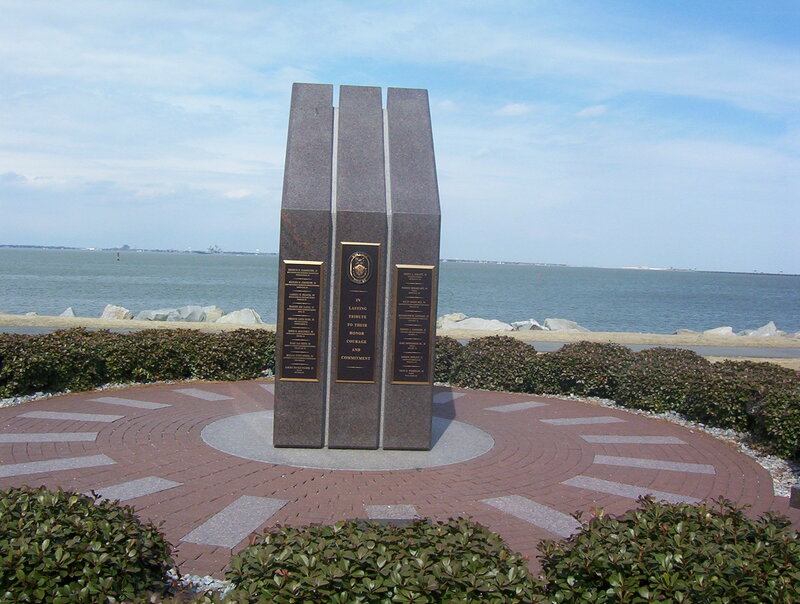 The Navy chose a strategic spot for the location of a memorial dedicated to those that perished in an act of violence obviously committed by al Qaeda, at a site overlooking the berth of the USS Cole – near the Norfolk Naval Station on the Elizabeth River in Virginia. Dedicated on October 12, 2001, the memorial is also very close to the USS Wisconsin, a World War II Iowa-class battleship open to the public for viewing as part of Nauticus, an interactive science and technology park. Frequently viewed by those who are also interested in the experience of Nauticus, the monument consists of 3 ten foot tall monoliths made of granite – each with a top that slopes in a 45 degree angle, intended to convey a symbolic salute to passing ships in Willoughby Bay. Two brass plaques attached to the monoliths list the names of those that died in the attack, while a third communicates the words “in lasting tribute to their honor, courage and commitment.” Brown markers that encircle the monoliths represent the darkness and anguish that pervaded the USS Cole that day, whereas an additional touch makes the memorial somewhat unique when it comes to monuments that recognize the victims of terrorism – involving the 28 black pine trees that are intended to not only remember the 17 sailors that died, but also their 11 surviving children. The USS Cole Memorial subtlety communicates a sometimes forgotten but important detail concerning transnational violence, and it is one that is aptly represented in the 11 trees that were planted for the victims’ children. Incidents of terror are far too frequent in the world, but the story only begins with the actual event of violence. Left grossly unstated after senseless acts of terrorism are the stories of those that live on as the survivors, struggling in the face of psychological scars – clutching their next of kin, and finding the will to live on in spite of heavy grief. This is perhaps the more significant story in any terrorist act – with no intention of implying that the person who has been cheated of life is trivial. But the courage of any one these individuals, in whatever manner they have managed to muster the internal fortitude to conquer the aftermath of terrorism, is a story perhaps best chronicled in an epic novel of courage. It is right and just that those affected should see their family member honored by a monument, so join us in signing the petition to which this web site is dedicated. Your signature can make it happen! This entry was posted in Posts for the Cause and tagged Aden, al-Qaeda, Architecture, monuments to the fallen, monuments to victims of terrorism, terrorism, terroristic violence, United States Navy, USS Cole, World War II. Bookmark the permalink.